If you are Batman (and you are...right? We’re going on a hunch, here) then you are not prone to using firearms (due to the unfortunate circumstances of your childhood). This is a noble decision--but we bet that it also makes crime fighting a bit more challenging. What ever is a nocturnal vigilante to do? POW! BANG! You batarang, of course! 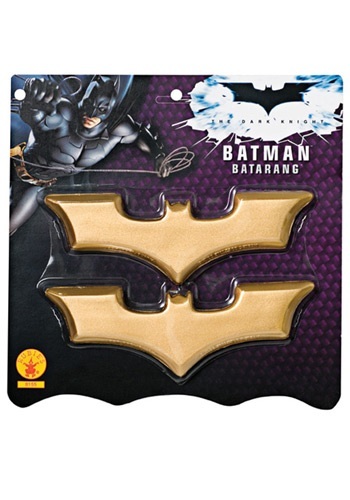 These Batman Boomerangs can provide you the assistance you need to attack bad guys without the use of guns. This set is the perfect accessory for any adult or kid’s Dark Knight costume because these batarangs are made of a tough poly/foam and have the signature bat shape. These gold boomerangs come as a pair so you can have non-stop fun this Halloween and help Gotham stay out of trouble...yet again.